In 60 BC, Caesar entered into a political alliance with Crassus and Pompey that was to dominate Roman politics for several years. Their attempts to amass power for themselves through populist tactics were opposed within the Roman Senate by the conservative elite, among them Cato the Younger with the frequent support of Cicero. Caesar’s conquest of Gaul extended Rome’s territory to the North Sea, and in 55 BC he conducted the first Roman invasion of Britain. These achievements granted him unmatched military power and threatened to eclipse Pompey’s standing. The balance of power was further upset by the death of Crassus in 53 BC. Political realignments in Rome finally led to a stand-off between Caesar and Pompey, the latter having taken up the cause of the Senate. Ordered by the senate to stand trial in Rome for various charges, Caesar marched from Gaul to Italy with his legions, crossing the Rubicon in 49 BC. This sparked a civil war from which he emerged as the unrivaled leader of the Roman world. After assuming control of government, he began extensive reforms of Roman society and government. He centralized the bureaucracy of the Republic and was eventually proclaimed “dictator in perpetuity”. 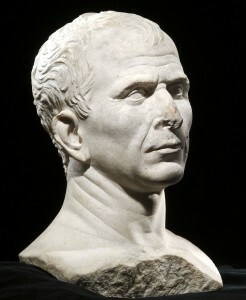 A group of senators, led by Marcus Junius Brutus, assassinated the dictator on the Ides of March (15 March) 44 BC, hoping to restore the constitutional government of the Republic. However, the result was a series of civil wars, which ultimately led to the establishment of the permanent Roman Empire by Caesar’s adopted heir Octavius (later known as Augustus). Much of Caesar’s life is known from his own accounts of his military campaigns, and other contemporary sources, mainly the letters and speeches of Cicero and the historical writings of Sallust. The later biographies of Caesar by Suetonius and Plutarch are also major sources.